This is a popular variety of Fritllaria grown in wet meadows. It is often found in Oxfordshire. These Fritillarias also go by the common name ‘Snake skin’. Over the years, it has picked up several common names included chess flower, frog-cup, guinea-hen flower, guinea flower, leper lily and snake’s head fritillary. Fritillaria is a genus of the lily family. Fritillarias form a nodding head from these early flowering spring bulbs that are so evocative of the British meadows and damp fields. 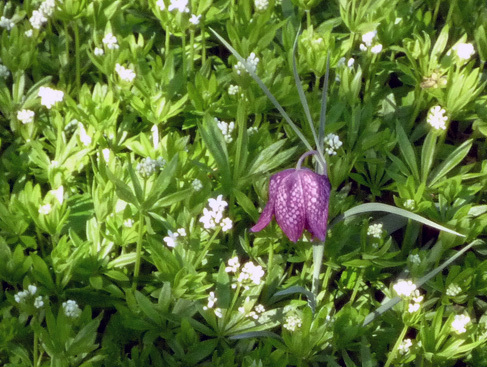 The most important thing about growing Fritillaria is they like to be in moist soil. They often grow well in meadows which get flooded. Soil: humus-rich, moisture-retentive soil. When planting try add well rotted compost or leaf mould. Bulb depth: Plant bulbs four times the height of the bulb; plant on their side to avoid the base getting waterlogged and rotting. The bulbs are fragile so handle with care. 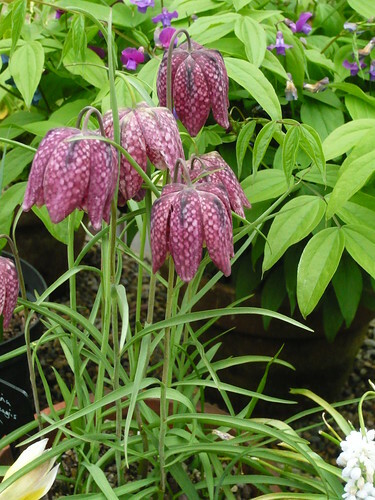 As my garden tends to become quite dry I have a difficult time growing fritillaries. But, I tend to enjoy wild fritillaries in the wet meadows common around Oxford. It is one of those plants where you really can’t force it on conditions it doesn’t like. If you really want to grow it, you would need to create a bog garden with an area of guaranteed dampness. 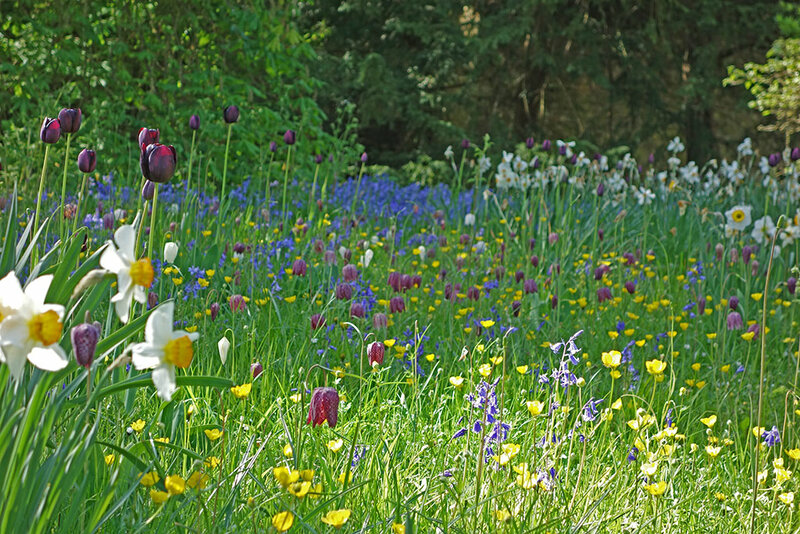 Fritillaries growing in Trinity College wildflower garden, Oxford. 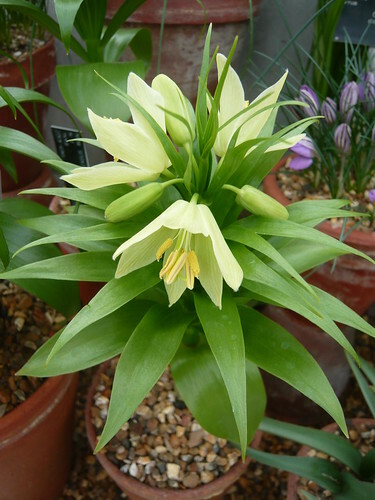 Fritillaria raddeana is a tall green flowering plant that can send up its head 4 feet high. Imperial Fratillaries and Fratillary persica like a dose of sunshine after flowering to boost the bulbs. Fritillaries grow well in meadows farmed in the traditional Lammas land regime. These are meadows allowed to grow until July. Then the land is grazed until mid February and then allowed to grow. This coincides with the Fritillary growing season. 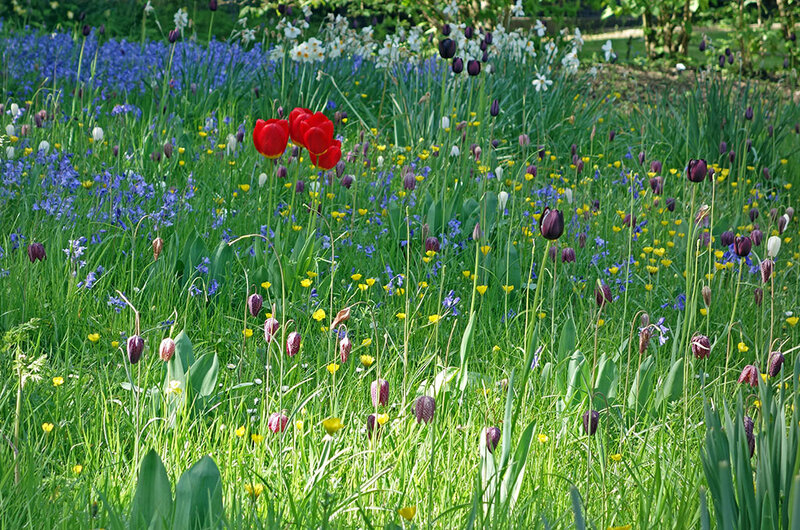 It is no surprise that the Fritillary society Ashmolean Natural History Society is based in Oxford where many of the meadows have been protected by the university.